Amazon created Alexa to be your personal assistant, but now it will serve some vacation-goers as their personal hotel concierge. 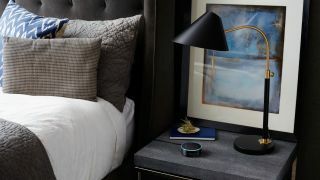 In hotels featuring the new Alexa for Hospitality service, guests will find an Amazon Echo, Dot or Plus in their rooms, connected to devices like the lights, blinds, climate control, TV and stereo via voice commands. Beyond your standard smart home (or smart room) commands, the Echoes will feature travel-related Alexa Skills. Guests can use Alexa to check out, ask for more towels, inquire about local attractions, order wine, turn on white noise or a TED talk, or request any number of other amenities. While the feature is not currently available, Amazon says it will eventually allow guests to temporarily connect their Amazon accounts to the hotel speaker, so they can access personal content like audiobooks on the go. Once guests check out, Amazon says the speaker will “automatically disconnect their Amazon account from the in-room device”. Alexa for Hospitality’s pilot program launched with Marriott Hotels as a partner. Marriott, which also owns Westin Hotels & Resorts, St. Regis Hotels & Resorts and other chains, will add Echoes to 10 US locations this summer, CNET reports. Other hotels have to request an invite from Amazon to join the program. One Las Vegas hotel installed 4,748 Echoes in its rooms back in 2016, but this may not have been officially sanctioned by Amazon. “Alexa for Hospitality makes your hotel stay a little more like being at home and gives hospitality providers new ways to create memorable stays for their guests,” Amazon VP Daniel Rausch said in a statement. Amazon also encourages partnered hotels to use the Alexa Skills Kit to create their own custom skills, which will let guests requests specific amenities and services. Hotel Wi-Fi is notoriously unreliable and vulnerable to hacking. Using Alexa voice commands for your internet needs instead of connecting your personal devices could help keep your data safe from prying eyes and malware. Still, even assuming Alexa doesn’t start cackling in the middle of the night, some guests may not want something that’s always listening in their private room. Amazon promises in a customer FAQ that hotel properties “can’t listen to what you said to Alexa or what she said back,” and says that stored recordings of customers’ questions will be deleted daily. However, the company also says, “Using Alexa is optional. If you do not want to use Alexa, you can push the microphone on/off button built on top of the device.” That seems to imply that these devices will be on by default when customers check in, which might anger some guests. We’ll have to wait see if this catches on, or proves to be a fad.